And now you too can be part of all the BLM fun! A full-time Paleontologist job has been listed for the Billings, Montana office. You know you want to be humming the BLM rap while working in that office. Apply now! Thanks to Darrin P. for the heads up on the video. Earlier this summer some new tracks, most notably sauropods and theropods, were found in southwestern Arkansas, in the same gypsum quarry where other tracks were located in the 1980's. Back then, Jeff Pittman had been doing some work at the quarry and often was displeased with the potholes he had to drive across every day. In late 1983 he and Dave Gillette confirmed that the "potholes" were actually thousands of sauropod tracks. The tracks were destroyed the next year. An account of that story can be found here. 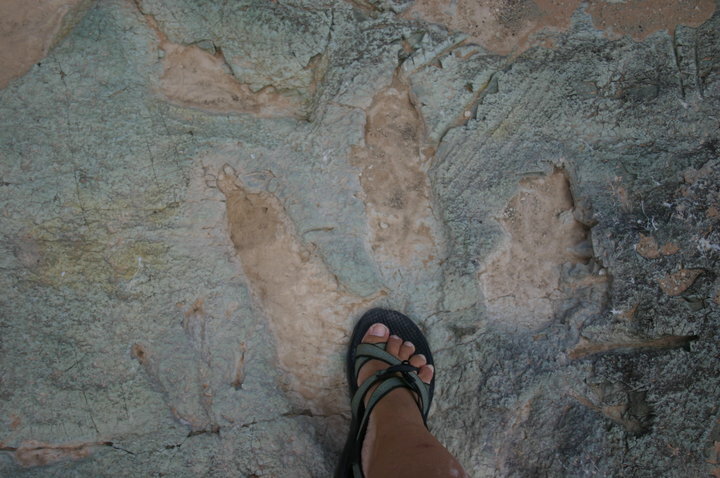 The large theropod tracks at the Arkansas site look very similar to a new track series near Moab near the base of Ruby Ranch Member of Cedar Mountain Formation (picture right). This site is currently being developed into a protected interpreted trail by the BLM. Stay tuned for more information on this site as it becomes available. The site is being worked on by Brent Breithaupt (BLM regional paleontologist), Neffra Matthews (BLM), and Martin Lockley (CU Denver - retired). It should prove to be a very interesting site once it is described. Work is planned to compare this site to the Arkansas site. The story below is the report from the University of Arkansas, my alma mater, who worked most recently on the Arkansas tracks. I was not involved in the work at this site. If you have any specific questions please direct them to Steve Boss. FAYETTEVILLE, Ark. – The discovery of a large field of dinosaur tracks in Arkansas has researchers busy using cutting-edge technology and traditional techniques to learn all that they can about the animals and environment that existed there 120 million years ago. The track site, found in southwest Arkansas, covers an area of about two football fields and contains the fossilized tracks of several species and tracks from multiple animals of the same species, some of which have never been previously documented in Arkansas. The site will help researchers learn not only about the creatures that once roamed through the area, but also about the climate during the Early Cretaceous period 115 to 120 million years ago. “The quality of the tracks and the length of the trackways make this an important site,” said Stephen K. Boss, who led the National Science Foundation-funded project. Based on the rock in which the footprints were found, researchers have a good idea of what the climate would have been like. The most dramatic tracks found, those of a three-toed dinosaur, measure about two feet long by a foot wide. The researchers believe the footprints might belong to Acrocanthosaurus atokensis, one of the largest predators ever to walk the earth. The site also contains the giant prints of sauropods, large, long-necked plant-eating dinosaurs such as Pleurocoelus and Paluxysaurus. Other prints pepper the site as well, but it will take scientists some time to determine what other creatures might have walked through that area. Thanks to a fast-track grant from the National Science Foundation, the University of Arkansas office of research and economic development and the J. William Fulbright College of Arts and Sciences, a team of researchers spent two weeks studying the site, which is on private property. In addition to chisels, hand-held brooms and plaster, some scientists brought along their computers. Jackson Cothren and Malcolm Williamson, researchers from the department of geosciences and the Center for Advanced Spatial Technologies at the university, documented the tracks using LiDAR, short for “light detection and ranging.” They used two different instruments to map the site. First, they used a Z+F Imager 5006i mounted on a cherry picker. The imager is a phase-based scanner that emits a constant beam of laser light, which is swept across the landscape to measure and record up to 500,000 points per second. The second unit, used to record an overview of the site from the ridge above, is a Leica ScanStation C10. This time-of-flight scanner incorporates discrete pulses of laser light at a rate of 50,000 per second, each recording a point in space. Depending on the path of a given laser pulse, up to four return pulses are recorded by the instrument's receiver. The location where each LiDAR return pulse originated is computed, allowing the researchers to study a three-dimensional “point cloud” representing the tracks. By using LiDAR, the researchers will be able to view a highly accurate map of the site’s tracks and take detailed measurements of the height, width and depth of individual tracks as well as measurements of the trackways. These measurements will help them learn details about the animals’ identities, movements and behavior. While computer imagery can give an overview of the dinosaurs, rock samples from the site can offer clues to climate. “Because we see footprints here, we know that this surface was at one time exposed to the elements,” said Celina Suarez, a postdoctoral researcher at Boise State University who will be joining the faculty at the University of Arkansas in the fall of 2012. This exposure means that scientists can learn information about the frequency of rain and amount of evaporation that affected this site 120 million years ago. Using this site and others, they can reconstruct a regional paleoclimate during the Early Cretaceous period, which may help them make predictions about Earth’s future climate. 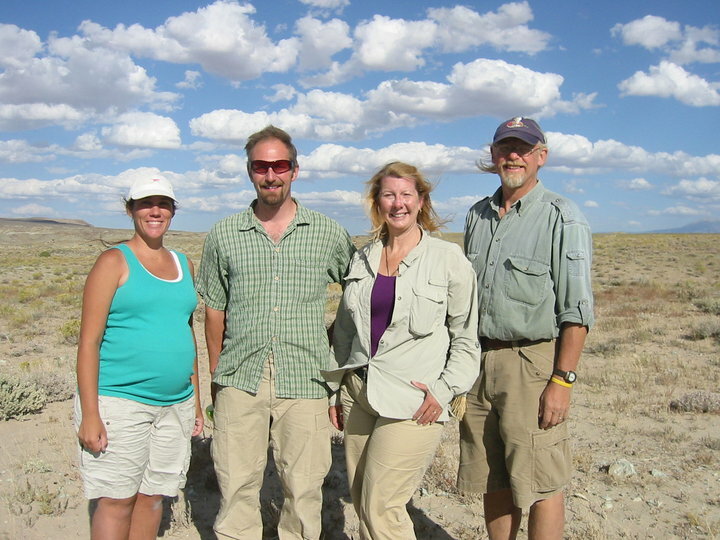 Other researchers involved with the project include geosciences master’s candidate Terryl Daniels; senior geosciences major and Honors College student Alex Hamlin; junior geosciences major Ryan Shell; Joann Kvamme, coordinator for the environmental dynamics program; and Kenneth Kvamme, professor of anthropology, all at the University of Arkansas; and Greg Ludvigson of the Kansas Geological Survey.